If you’re thinking of buying a new or used hot tub, there is going to be an awful lot of research in your immediate future. You can start by reading up on all the best hot tub brands that we present in this article. You’ll have to look into what features you’ll need, what features you can do without, and how much each of them is likely to add to the total cost. You will need to decide between indoor, outdoor, above ground, built-in, partially built-in, or even inflatable options. You’ll need to think about how you intend to use the hot tub. How much effort and expense are you willing to put into operating and maintaining it? You’ll need to consider how important the environmental impact of a new hot tub is to you – both during its manufacture and its operation and after. You may even decide to look at a used hot tub and this guide will help you in that decision as well. If you are looking at a used Hot Tub I would strongly suggest investing in a new Hot Tub Cover that you can purchase by following this link. How do we rank the Top 20 Hot Tub Brands? While there are a huge number of brands available today, you’ll probably want to restrict your research to the best hot tub brands on the market. But the best for what? Most manufacturers make a bit of something for everyone, but they all tend to focus on one or two things that they do particularly well. Some of the better known brands outright specialize in one particular thing and only do other things as an afterthought. You wouldn’t want to spend a lot of time researching a swim spa company when you are looking for a massage therapy hot tub. If you’ve already read some of our other articles on getting ready to buy a new hot tub, you should be ready to start researching specific brands and models. Before you do, though, you should take a look at this overview of the 20 best hot tub brands available. Doing so will help you focus your search and save you time and effort. 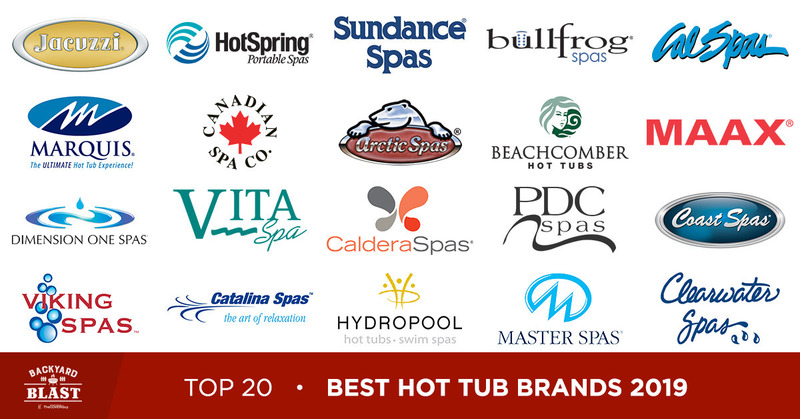 So, without further ado, The Cover Guy gladly presents a roundup of the top 20 best hot tub brands in North America. Our research comes from first the number of replacement covers we make each year for specific brands. With over 30,000 covers sold per year it gives us a pretty good indication on what hot tubs are selling. Next we rely on over 60 years of service in the Hot Tub industry to add our own personal thoughts and comparisons on all the hot tub brands. Lastly, we listen to our customers and their pro’s and con’s on the hot tubs they have chosen for their backyard. So we feel pretty confident that the list presented is very accurate. This is a brand that has been providing quality hot tubs for so long that their brand name has come to mean any kind of spa or hot tub. People with other brands of tub will still hop in ‘the Jacuzzi’ for a soak. There was really no question about where to put Jacuzzi on this list. Jacuzzi is the benchmark against which all other brands tend to be measured. 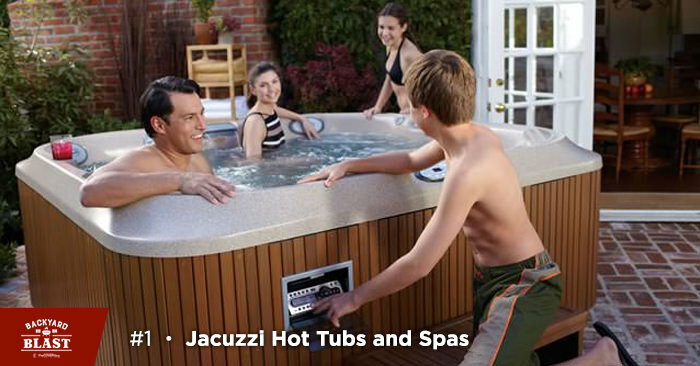 With the largest network of dealers Jacuzzi will be able to provide your hot tub with the applicable service needed through its lifetime. Jacuzzi tubs generally work without problems, and to do so for a very long time. Jacuzzi owners often comment on the great balance between number of options and ease of use. Because Jacuzzi uses aerated jets (air is mixed with the water) you can safely use essential oils in your tub without damaging the water filtration system with residue. They also use waste heat from the motor to help maintain water temperature, which provides some decent energy savings over the life of the spa. Its a wonderful story how the Jacuzzi hot tub or business started. Candido Jacuzzi was merely trying to make his son Ken’s disabilities less painful. He found the warm pools in the hospital was helping Ken and thought what about a home version, something portable so Ken could enjoy the benefits daily. And so that is just what he did, and it started building a rejuvenating hydro-therapeutic spa out of there family tub with a motor that agitated the water. From there the Jacuzzi brand took off on a new branch making home spas. The development over the years is amazing and Jacuzzi has been at the forefront of development, and has the most dealer outlets around the world to service their customers. It is also important to note that Jacuzzi also makes some very well-respected walk-in bath tubs. If your main goal is hydrotherapy, in particular for mobility issues, if actually using a hot tub could be difficult, or if you are facing space constraints, this could be a very good option. Number two on our list of the best hot tub brands is Hot Springs Spas. Similar to Jacuzzi in terms of price points and reliability. Hot Springs Spas has one key advantage over many other brands, the attention to design in their upper level Hot Tubs. They have been working with the company Designworks which is a BMW group company that builds comfort and design. So you can be assured that this design is carried through their hot tubs giving you a comfortable well designed seat. The comfort in the seats is one of the most important elements in choosing a hot tub or spa. One of the things most often praised by owners of Hot Springs Spas hot tubs is the ready availability of parts for most of their line. That includes many of their older models that may be well out of warranty but are still going strong. One other feature that really sets Hot Springs apart from the crowd is the availability of a salt water system for many of their models. The primary advantage to a salt water system is that it is much easier to keep clean and sanitary as salt kills bacteria. Hot Springs has three independent lines of hot tubs that they offer, each level goes up in function as well as price. Keep in mind you are only going to buy one hot tub in the next decade so we suggest looking at the top of the line offered if it is in your budget. There is more bang for your buck in the higher end of the Hot Spring Spas and hot tubs. Service and repair is easy with dealers all over the world. The top side digital read out will guide you through a series of error messages to identify any issues with your hot tub. Sundance Spas is the largest builder of acrylic hot tubs in the world, that alone tells you something about this company. Since 1979 Sundance has been delivering a great product to their customers backed up by a super group of dealers. The models and design of the Sundance Spas are some of the best available. Often in the top part of our list it will come down to the comfort you find in the model you choose from any one of these fine hot tub builders. Each has unique features and designs. Everyone is different height, weight, it all comes into play in choosing your hot tub. Sundance hot tubs are one of the best hot tub brands being one of the first to incorporate a UV water treatment system. The tubs use ultraviolet light in the filtration system to kill bacteria in the water. This results in a more natural, less chemical-laden hot tub experience. 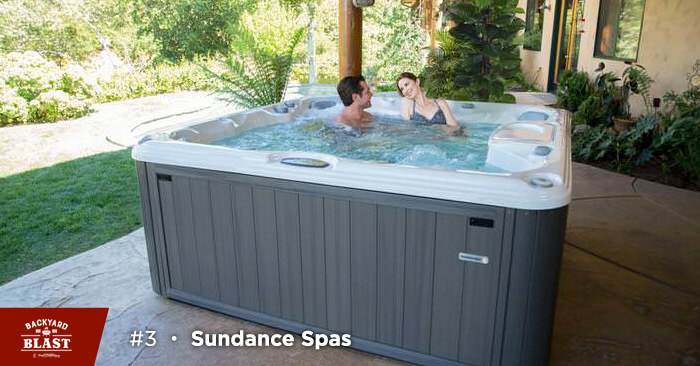 Parts and Service for Sundance Spas is also easy to come by, as their are many dealers throughout the world. Another way in which they prove themselves as one of the best hot tub brands is with the customization of look available in the fit and finish of your hot tub. Sundance tubs also use an easy to navigate electronic control panel and most models have an optional Wi-Fi module that allows remote management via smart phone. 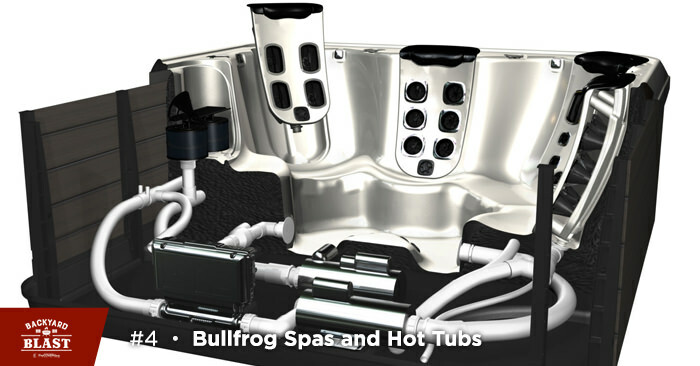 Bullfrog Spas and Hot Tubs is an amazing and innovative company. I have been in the hot tub and spa business for over 30 years and not much changes, well not in a big way. When Bullfrog Spas came our with their interchangeable Jet Packs it was jaw dropping innovation for the industry. So, when you have a dedicated team of engineers and company like Bullfrog you can’t help but be on the top end of the scale. I am a huge fan of the interchangeable jet pack, because it gives every seat the option of the hydro-therapy you desire. So it goes without saying Bullfrog is famous for their jetpacks. These are specially designed jet modules that can be removed and swapped out for other modules depending on how you want to use your tub. This design is meant to reduce energy costs by reducing the amount of plumbing used while providing an unparalleled amount of customizability. It is uncertain how frequently most current owners actually change their jet packs, but it’s nice to know you can should you choose to do so. Bullfrog hot tubs are primarily aimed at the relaxation and hydrotherapy markets, and they are on this list of best hot tub brands because of their innovation and design. 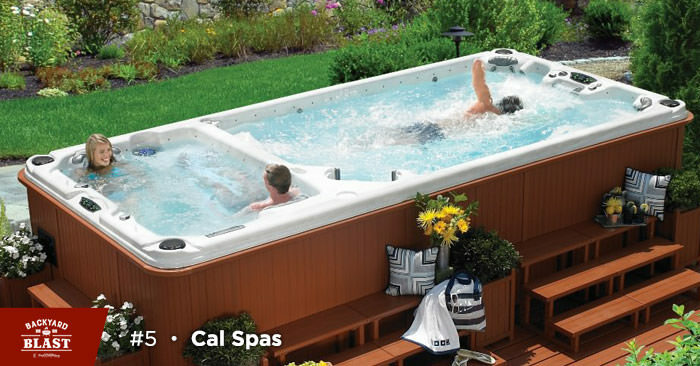 Cal Spas was established in 1978, and is one of the top manufacturers of recreational products for the home in the world. The Company has over 28 trademarks, and 48 patents to its credit. Cal Spas also boasts over 250 hot tub and spa products for the home. This includes both hot tubs, and swim spas. There is a great selection of different sizes and molds to fit every family. Cal Spas hot tubs come with a variety of entertainment options. These are tubs mostly aimed at a family/recreational use case. One of the biggest features somewhat like Bullfrog although more permanent gives the customer the ability to choose their own jetting package with the new Cal Spas U-Select Hydrotherapy program. The U-Select Hydrotherapy program gives the customer 10 jetting packages to choose fro for each seat in the hot tub. Cal Spas are well thought of with regards to hydrotherapy. The company has been involved in the making of hot tubs and spas for a number of years and their precision engineering gives their customers some of the best hydrotherapy options in the market today. Customizable therapy options and adjustable water jets make sure each spa session is a great experience. Technologically advanced heating and pumping systems offer reliable temperature and flow control so that each minute in a Cal Spas is a minute of pure bliss. Cal Spas are easy to repair with parts and service are available in every area of North America. The Cal Spas as most of the top brands have error codes that direct you to any issues very easily. Cal Spa error codes and maintenance can be found in this document. Like the four brands before you are missing nothing in the selection of a Cal Spas it is truly one of the best spa and hot tub brands in the world today. Highly rated Marquis Spas makes both hot tubs and swim spas. They are one of the best hot tub brands because of their reputation for quality and craftsmanship. They have a stated dedication to the therapeutic aspects of hot tubbing and maintain a function over form mentality. Marquis has introduced two amazing systems to their hot tubs that garantee the best hydrotherapy in the industry. The High Output Therapy or HOT, and the Vector-Optimized Laminar Therapy or VOLT system. These two systems add more water flow in the right areas to give you a training level hot tub. Marquis also offers Microsilk treatment within your spa. The Microsilk is a smaller oxygen induced bubble that the Marquis Spas release into the water. The Microsilk leaves you with soft ageless skin, like you have been to a spa. Marquis Spas’ philosophy of hydrotherapy is that the strength of the jets in a hot tub is less important than the combination of several factors including jet strength, temperature, and friction. Jet control is more important than sheer jet strength. Reviews and owner testimonials indicate that they know what they are talking about. Lastly, the Marquis Spas easily serviced and repaired with dealers throughout the United States and Canada. 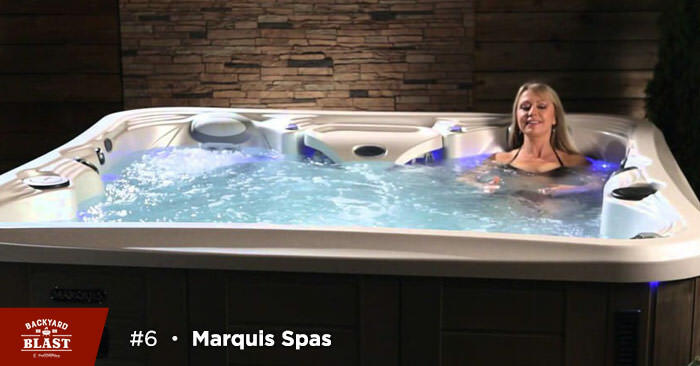 Marquis uses its topside control error codes to indicate if there are any issues with the spa or hot tub that need to be serviced or replaced. Canadian Spa Company makes hot tubs, swim spas, and portable spas as well as manufacturing saunas, gazebos, and surrounds. They have received awards in the “plug and play spa” category for their portable and inflatable spas. Canadian Spa Company can be found in just about every major box store around the world. In North America they can be found in Home Depot, WalMart, and Lowes just to name a few. Where they really stand out is in their inflatable and portable spas. Some of their inflatable and portable units can be put in the trunk of a car. This is truly what someone can call portable. Set it up anywhere in minutes, and take it from one location to another. 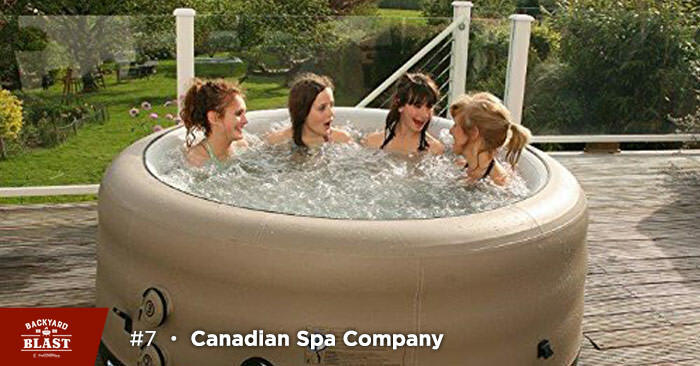 Canadian Spa Company supplies portable hot tubs and swim spas all over the world. They supply to both small dealers and large box stores. This makes them one of the new big players in the market. And one of the Best Hot Tub Brands in the world today. 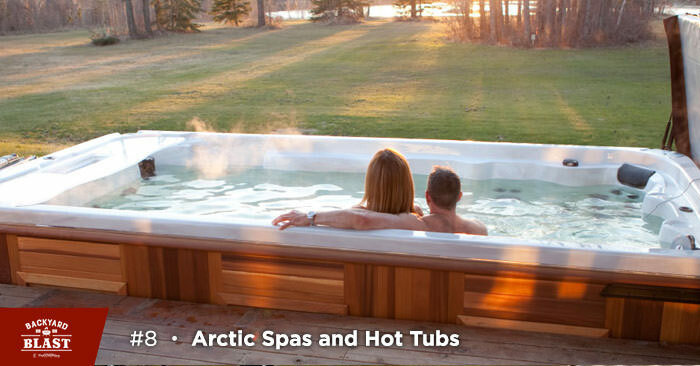 Canadian Spa Company is well respected for their traditional swim spas and hot tubs as well. They are also known for their customer service and after sales service. It’s the reputation of their inflatable spas, though, that makes them one of the best on our list. Arctic spas are one of the best hot tub brands in the world because of their significant innovation within the hot tub industry. They are the first company to design and produce an all weather swim spas. Arctic uses the same unique technology they use on their hot tubs. They are also renowned for their incredibly efficient heat recovery system and insulation package. It makes their products highly efficient in even the coldest climates. They were also one of the first hot tub companies to allow smart phone control and monitoring of your hot tub. The Spa Boy that manages heat and sanitation of your hot tub remotely. This is the newest part of Arctic Spas cutting edge approach to the hot tub and swim spa industry. The Arctic brand of hot tubs and swim spas does not stop there, the design and hydrotherapy is second to none in the industry as well. So like the companies before Arctic on this list you will not be giving up comfort, design, and hydrotherapy for new innovative technology and efficiency with an Arctic Spa. And if you’re in a Northern climate you might want to consider moving this well renowned hot tub brand up in your search for a new hot tub. Oh, and when they say “all weather” they really mean all weather. Arctic parts and service is always available with a strong dealer network throughout North America. Arctic Spas top side control will give any error codes needed identify and to repair the hot tub. Arctic Spas also has a nice line of other outdoor equipment to go with your hot tub like gazebo’s, grill houses, and wooden accessories. 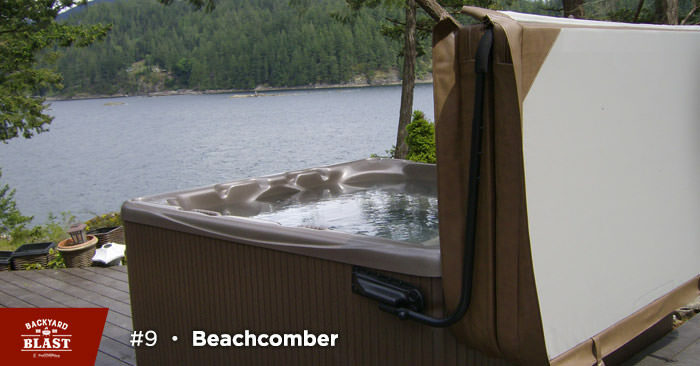 Beachcomber a long standing Canadian Company is a brand that manufactures tubs that are best described as affordable for a decent quality hot tub. They have a function first design mentality that results in a look that some might consider plain. That also results in an easy to service and maintain hot tub than many competitors. Beachcomber has been around a long time and has many dealers throughout North America. Their hot tub designs and molds are simple yet very comfortable and many customers enjoy the simplicity of them. Somewhat like Arctic Spas, Beachcomber does well in northern climates as they are always working to make their hot tubs efficient and affordable in the colder climates. As far as parts and service the Beachcomber dealer network is wide spread. Owners should not have an issue finding either. The Beachcomber hot tub like most hot tubs have error codes that will identify any issues that need to be addressed. Beachcomber makes a decent, reliable, mid-range hot tub that is generally well liked by those who own them. It is this consistency that lands them out number 9 spot. Just who is Maax spas? Maax spas is a huge manufacturer and group that started in 1987 making bath tubs. In 1997 Maax entered the hot tub world buying Coleman and Cooperage spas. Since then Maax has been producing hot tubs. They have a huge dealer network that includes some of the largest box stores in North America and around the world. Maax continues to grow its brand by purchasing other top end Hot tub brands. By 2007 Maax became the fifth largest manufacturer of hot tubs in North America. They continued their growth with the acquisitions of LA Spas and Vita Spas between 2009 and 2014. 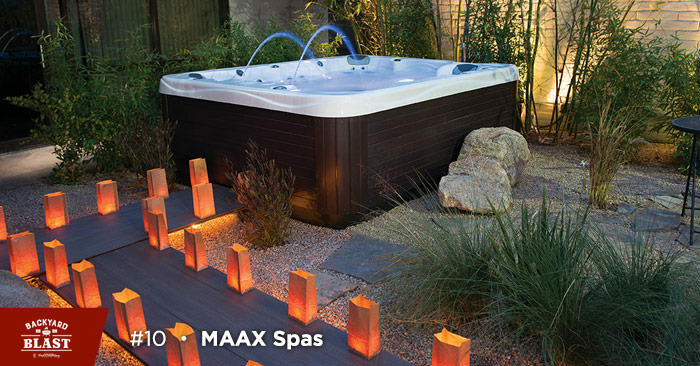 With these acquisitions Maax became the third largest supplier of hot tubs and spas. Also, making them one of the Best Hot Tub Brands in the world. In 2018 Maax is yet taking another direction in the hot tub spa world. They have announced their new brand American Whirlpool. So, with all that said I suppose Maax Spas is now American Whirlpool and Vita Spa both. With the rest of the brands purchased going by the wayside. The newly branded American Whirlpool will have both hot tubs and swim spas. Many of the models will look similar to Maax former customers. With seven swim spa models available customers will be able to pick and choose the best set up for their needs. And with 21 hot tub models to choose from you can’t go wrong in this category either. With the large dealer network service and parts should not be an issue. The top side controls of the Maax spa identify all errors and with the codes you can check for a recovery solution within your guide book. 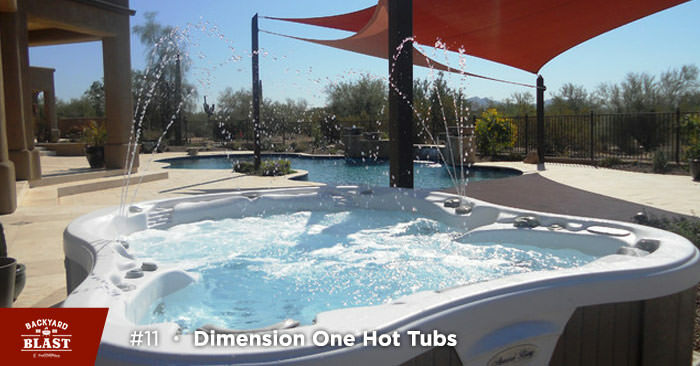 Dimension One hot tubs and Swim Spas or as most refer to them D1 has been pushing the envelope of design and performance since they first opened up the doors in 1977. Billed as the home of the biggest and deepest spa in the world. D1 has a huge lineup of retailers to support their amazing line of Hot Tubs and Swim Spas. D1 is one of our favorite choices in the hot tub and swim spa brands. And is definitely one of the Best Hot Tub Brands. Not only does D1 supply some of the best molds available in the market place. They have a promise of providing their hot tub bathers with the most pure water available on the market. They have developed UltraPure water management system. The UltraPure water management system cuts down on the amount of chemicals needed to keep your spa pristine clear. D1 is a leader in the hot tub and swim spa industry and has won many awards for their design and progressive water care treatment. Being one of the first fully insulated hot tubs. And with a progressive heating element your D1 hot tub will also run at an extremely low budget. The top side control called the hub is ahead of its time in function and intuitiveness. The hot tub will generate error codes when ever maintenance is needed, which will not be often. Parts and service will not be an issue with D1 as they have a strong dealership around the world. One thing you will want to be sure of when ordering a replacement hot tub cover for your D1 hot tub is the model. With the curvature of some of the models you will need a company aware of how to make these replacements like The Cover guy. Vita Spa brand is actually owned by Maax spas and so shares some of the same technology and manufacturing processes. This line of tubs is marketed as a lifestyle option, and therefore focuses on massage tubs and exercise/swim tubs. 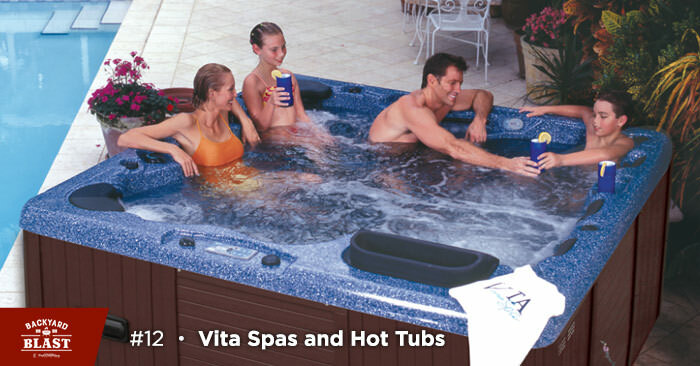 Vita has 9 Swim Spa models and 21 hot tub models. There is a very good chance you will find a model that works for your family and budget. The x series tubs are built to accommodate a variety of resistance-based exercise attachments. The swim tubs use what they call the xStream Force Jet Propulsion System. This system is meant to reduce the amount of turbulence produced by the swim jets. Vita Swim Spas and Hot Tubs are built with a solid metal frame and uses a composite wood decking material so it is always maintenance free. Vita also has a numerous amount of jetting arrangements to give its customers a great hydro-therapeutic spa. The Maax manufactured Vita Spa has a fairly large dealer network. Servicing and parts are available and easy to come by. The Vita spa top side offers all the information needed and supplies error codes as needed for any repairs or service. 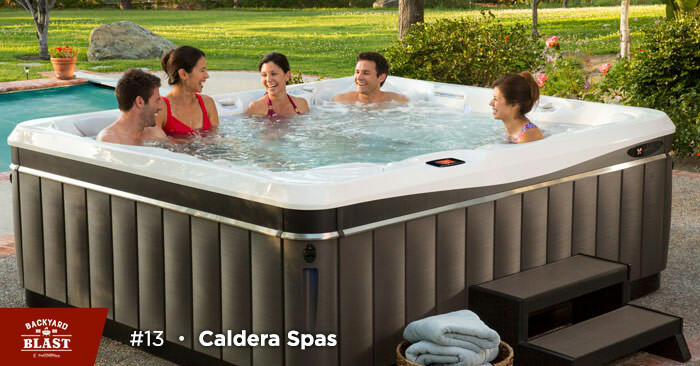 Caldera Spas and Hot Tubs is another great brand of spas that you will not go wrong with. Caldera Spas have been in existence since 1977 when Watkins Manufacturing first started the program. Today Caldera Spas focus is a perfect trifecta of balance between Comfort, Design, and Performance in their hot tubs. We at The Cover Guy and their customers agree they are hitting all three of these elements extremely well. Caldera produces hot tub models spanning from 2-seaters to 8-seaters. There are three different entry points into the Caldera Spas line, and each have options for different sizes and shapes. The Utopia, Paradise, and Vacanza Series from Caldera will hit all hot tub customers needs and budget. Caldera has a great line-up of dealers throughout the world so purchasing and ongoing service is not an issue. Caldera parts for repairs are readily available. The top side mount will give you an updated error code read out, if you are having any issues. PDC Hot Tubs and Swim Spas is a company of survival and at the end of the day have become one of the best hot tub brands in the market today. They’ve been in business for just over 60 years. They started as a company that made fibreglass swimming pools, jeep bodies, and horse therapy units. In the early 80’s they saw a trend towards hot tubs and followed that path. PDC Spas produces hot tubs and some of the best swim spas available. They provide hot tubs and swim spas across all price points and feature sets. If you had to pin point one thing they specialize in though, it’s their swim spas. They have one of the best swim current systems in the industry. PDC has introduced some industry firsts like their Air’assage system and their PowerFlo filtration. The company has also expanded around the world. Their product and can be found in Russia, England, France to name just a few. With a world wide dealer network parts and service are always available. Coast Spas boast a 24 model hot tub lineup and a 5 model Swim Spa lineup. The hot tubs are all unique. There is a price point and design for everyone looking for a hot tub for the yard this year. They pride themselves on the quality of their manufacturing and design. Coast Spas specializes in portable tubs, and were quick to incorporate some of the newer technology in the industry. They’ve been doing mobile app control and touch screen control panels for a pretty long time. As well the Hydro-Cyclonic pressured filtration is a new developing filtering system. The System filters faster and more efficiently based on tests. They produce the only portable tub on the market with an infinity edge. Service is not an issue as they have dealers all over the world. 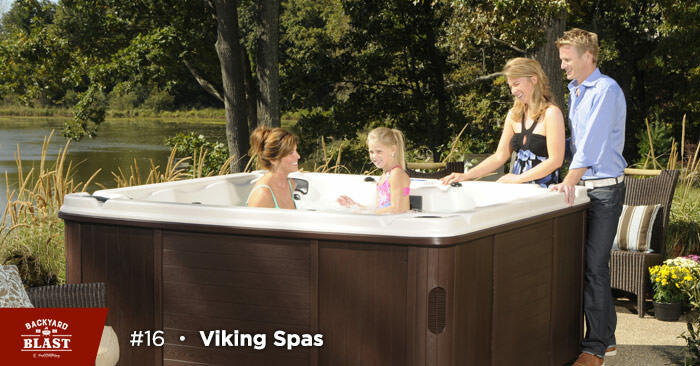 Viking Spas and hot tubs are generally considered to be a solid, mid-range hot tub. They have good build quality and the standard range of features, generally at a reasonable price point. While they don’t do too much out of the ordinary, they do use a proprietary filter system. They use this Cloth system rather than the more common pleated filters. Some owners have recommended stocking up on extra Viking Spas filters when they can find them. The do because they can be difficult to find if local suppliers run low. This is a problem easily solved by purchasing your consumables online. Catalina Spas has been making hot tubs since the early 70s. They bought a swim spa manufacturer in the 80’s and they’ve been making both swim spas and hot tubs since. They specialize in portable spas. 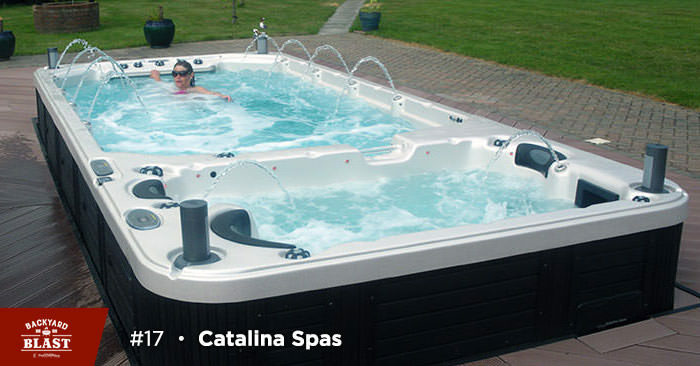 Catalina Spas also provide many options to customize the look of the tub. Most of their swim spas also incorporate seating for when you just want to relax. This can be before, after, or instead of a swim. They have an impressive selection of models that spans indoor, outdoor, portable/above ground, and partially in-ground options. Hydropool hot tubs and swim spas has been providing quality hot tubs since 1978 and has been building their own since the early 80’s. The little company then has grown to over 250 dealers in over 40 countries. The number one item Hydropool is known for the most is their excellent swim spas. 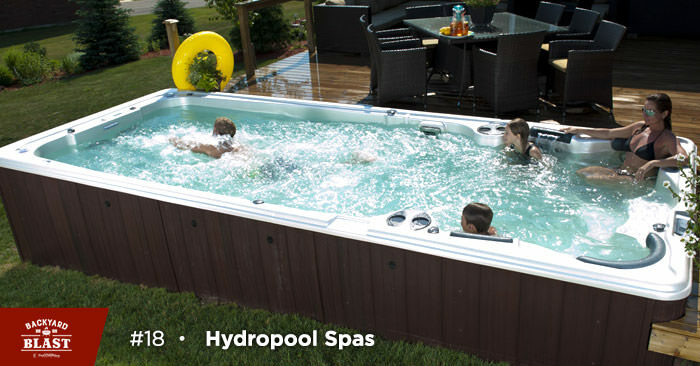 Hydropool started making the large swim spas for swimming enthusiasts as far back as 1997. Making them one of the longest standing swim spa manufacturers in the world. They also, boasts that their energy efficiency and the self cleaning hot tubs are the best in the industry. Hydropool has won a number of awards and is very highly thought of in the industry. They are known for their innovation and their models. All 19 hot tub models and 11 swim spa models are made with quality and pass a stringent quality testing. Like all of our top 20 best hot tub brands Hydropool is an excellent choice for your home. There are little differences between the #1 and the #20 brand in our list presented here. The most important thing is to try the tub before you buy. Make sure you are comfortable in the seats. And that every family member has a good seat in the hot tub. 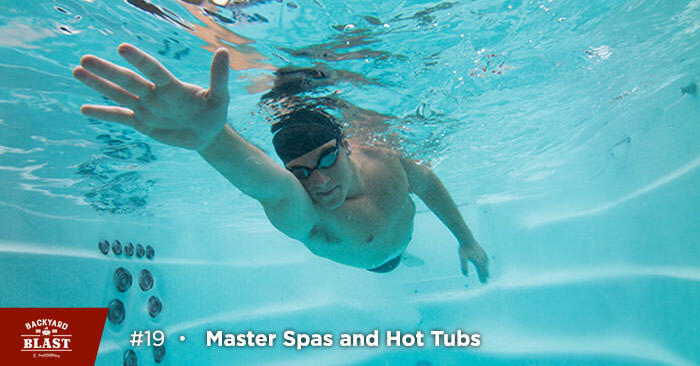 Master Spas is the company that makes the Michael Phelps branded swim spas. That being the case, you can be pretty sure they make a quality swim spa. They don’t just focus on the exercise aspect, though. They also make sure to incorporate elements to assist in recovery afterwards. Each Master Spas hot tub model comes with a special neck and shoulder seat. This seat uses downward pointing jets to give more deep tissue massage. They are also known to be very selective in choosing and training their licensed dealers. Master Spas understand that their licensed dealers are the people who represent their company. They want them very well trained before dealing with customers. An interesting side note: their biggest hot tub is rated to seat 9 adults comfortably. This is larger than most other manufacturers who top out at 7 or 8 people. Clearwater Spas is one of the Best Hot Tub Brands since 1976. The Company is based out of Seattle and is known for their Hydrotherapy jetting and their environmentally sound hot tubs and building processes. Clearwater Spas uses recycled and eco-friendly materials in the construction of all their hot tubs. They’ve even engineered their own ecologically sound replacement for fibreglass resin. Clearwater Spas hot tubs are aimed more at those who want to slow down and relax and be treated the most amazing hydrotherapy. They start their process of delivering the best massage by looking at the massage characteristics and pressure points. Swedish, deep tissue, shiatsu, Thai, reflexology, and physical therapy massages. They have identified 12 points of the body to target. And with jets and ergonomic seating deliver hydrotherapy like no other hot tub available. 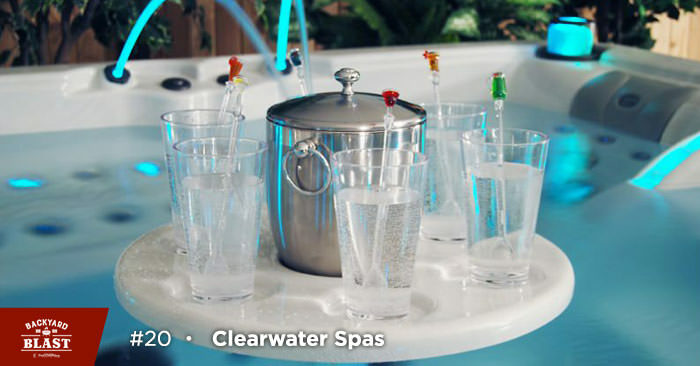 Clearwater Spas boasts 21 different models of hot tubs. So you can be sure to find one that suits your family and your needs. Clearwater Spas wants to enhance the hot tub experience and also has numerous entertainment options. Options such as music and mood lighting, and modern and customizable controls. Ease of use is at the top of their priority list when building their Spas. So there you have it – an overview of the 20 best hot tub brands available today. Hopefully this post will give you what you need to make a confident and informed decision about which of the best hot tub brands to look into in more detail. Also, make sure to read our other “before you buy “articles to point you in the right direction.